And in no small way… It has touched all who attended. It was for PodtoberFest 2016, but more than that, it was the first family reunion of Shumway. Soon, those who didn’t listen live to the spectacle over the two days will get their chance to hear it, but for a few short weeks, it belongs to those of us who were there, those who were in the room. PodtoberFest 2016 was by all accounts a success. There is no comparing it to last year because it was a completely different event, which is how we planned it. Everyone had their opportunity on mic and everyone had their chance, however fleeting, to enjoy the company of one another in person. This was a much more personal and social event behind the scenes, and maybe on mic, too, than it was the podcasting event of the year. And when it was over, we spent more time with each other. We played Cards Against Humanity, in which the nicest man in the world, Diamond Dave, somehow managed to win. And then the Canadians left, Doug and Paula drove back to their homes, while Dave was finally introduced to Spaceballs thanks to The Angry Ginger, before he boarded a plane for his snowy home. Grant, Beth, Bill, Stef and I enjoyed the great outdoors of Grant’s backyard, before sitting around a firepit. We watched some TV, just enjoying being together, a luxury we don’t normally have. We split up on Monday for some reason. Grant and Bill watched some TV together, while Stef and I took in a museum and planetarium, discovering some of the culture in Grand Rapids. And later that evening we all coalesced into a group again, for one final meal and more podcasting, where we were again joined by Ginger. Tuesday morning Stef flew out, while Bill and I started our journey home. And on Wednesday, Bill and I returned safely to our respective lairs, while everyone else returned to work. Now, one week to the day that we all came together, I sit here writing and thinking more about the behind the scenes than the on mic. Of course, it went by fast. Of course, it was a once in a lifetime event, because you’ll never have this group meet up for the first time ever again, but I hope it’s certainly not the last. And of course, we’ll always have the stuff on mic, recorded and soon to be released so that we can relive it and share it with all of you. But there’s a lot more here, than the podcast. Being in the company of what was once our “Pod Family” we are all extremely aware that “Pod Family” has an extra word in it that doesn’t belong. We are just “Family.” We are lucky to have found each other. Lucky to have a common connection that brought us together in the digital world, and lucky that we were able to physically enjoy being in the same space, even if it was for a few fleeting moments. Paula goes back to doing her thing. Driving her mobile studio all over to record bands for Tell Me Stories Podcast, though I do believe you might be hearing more from the Shumway members on her show in the coming months. 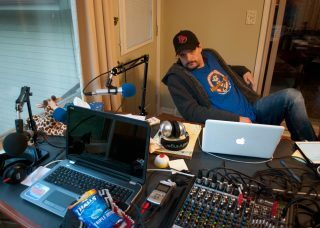 Diamond Dave, will return to The Diamond Dave Show, Diamond Minds and Chronicles Unwritten, with a vengeance as winter settles in and he spends more time “on mic” than “in jeep.” And on his shows too, you may hear more Shumway voices. Dougie will continue to be our IT guy, but not before going to Japan, where I expect, upon his return, someone in Shumway will get him on air to tell us of his adventure. An individual after my own heart, where rest is for the weak and creation is what we do. Ginger will do as Ginger does. Podcasting on 7 Days A Geek, Podcasting 101, and writing, while probably launching a few more shows and diving into a few more projects. 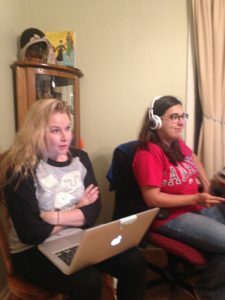 Stef will, despite Grant’s shock and awe, continue to watch Gotham for her co-host duties on Gotham Lights, while writing for her blog, From Brain to Keyboard. Bill will continue The Wicked Theory Podcast, because that’s what Bill does, until he’s got Preacher Vs Preacher back up and running after the break between seasons. 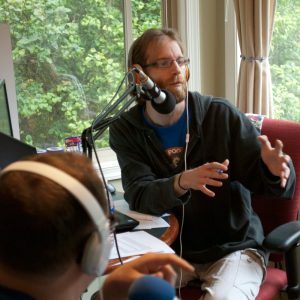 Grant will still be a part of 7 Days A Geek, and I firmly believe he’ll waiver back and forth on relaunching The Stranger Conversations in a different kind of format, or at least, he’ll talk to us about what he wants to do, until he finds that magic formula he’s looking for. And me? Well, I’ll keep producing the podcasts I produce, and assisting others as I tend to do. I will keep writing and looking for other things to keep me busy. But most of all, for all of us. Whether it’s another PodtoberFest or some other reason… We’re all looking forward to the next get together. We’re all hoping it will be sooner than later. And we’re all wishing nothing but the best for each other. We are Shumway, a fictional corporation that is as real as family can get. 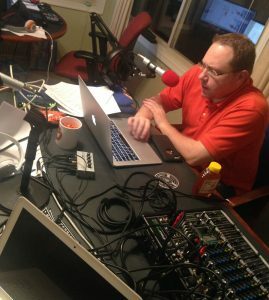 As a fairly new follower of the Shumway group of casts podtoberfest was great to experience as a listener. I can only imagine how much fun it was to be in that room. The chat room was a buzz of activity from the faithful followers and really show how big the extended family fis. Great job everyone and can’t wait till next year. We who faithfully listened on the live Mixlr feed could feel the energy on mic, which was clearly generated by the off-mic inspirational conversations. 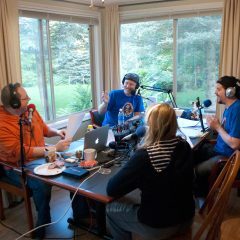 Everyone who gets to listen anew when the #Podtoberfest shows are posted are in for a treat of podcasting hyjinx.